Welcome to the 8th Foodie Friday! In honor of this week's feature recipe, I'm making this week a Mexican theme. You can really link up any kind of Hispanic recipe. It doesn't have to be Mexican. This week's feature recipe comes to us from Becky @ Mrs. Bettie Rocker. She actually submitted this recipe weeks ago and I finally made it last week. I'll most likely be making it again this week because IT. WAS. THA. BOMB! You can either make it as a chicken dish or as a vegetarian dish. I went the veggie route on this one. (When she linked them up, she called then Loca 'Ladas.) Love that! Becky sez: "These are crazy good and crazy filling! I'm adding a couple of variations at the end for my Veggiesaurus friends and people who don't have all day to spend in the kitchen. These are pretty time consuming but totally worth it!" 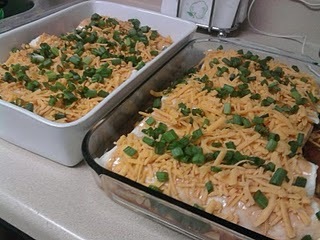 (His & Hers Enchiladas ready for the oven. 1.Place the chicken in a large pot and add water to cover. Bring to a boil over high heat, then reduce the heat to medium-low, cover, and simmer until the chicken pieces are no longer pink, about 10 minutes. Shred chicken by placing two forks back to back and pulling meat apart. Set the shredded chicken aside. Meanwhile, combine the cream of chicken soup, sour cream, and chili powder in a saucepan. Bring to a simmer over low heat, stirring occasionally, then turn off the heat and cover to keep warm. 2.Heat the butter in a skillet over medium heat. Stir in the onion; cook and stir until the onion has softened and turned translucent, about 5 minutes. Add the shredded chicken, chopped green chilies, taco seasoning, half of the bunch of chopped green onion, and water. Allow to simmer for 10 minutes. Stir in the lime juice, onion powder, and garlic powder; simmer for an additional 10 minutes. 3.Preheat an oven to 350 degrees F. Stir 1 cup of the soup mixture into the skillet with the chicken mixture. Spread the remaining soup mixture on the bottom of a 9x13 inch baking dish. 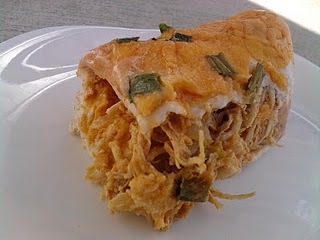 4.Fill each tortilla with chicken mixture. 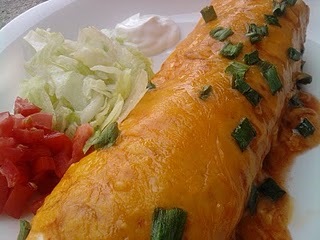 Sprinkle Cheddar cheese over the chicken filling before folding the tortillas, reserving half of the shredded cheese for topping the enchiladas. Fold tortillas over the filling and place seam-side down in the prepared pan. 5.Pour enchilada sauce evenly over the enchiladas. Cover with the remaining 1 1/2 cups of Cheddar cheese. Sprinkle the reserved chopped green onions and the sliced olives on top of the cheese. Bake in the preheated oven until filling is heated through and the cheese is melted and bubbling, about 25 minutes. For Vegetarians (Ovo-Lactos): Just sub the Cream of Chicken Soup for Creamed Corn, and instead of chicken, sub in Rice and Black Beans. Rinse and drain the beans, and cook them on low-low, and follow the directions for seasoning and simmering the chicken. 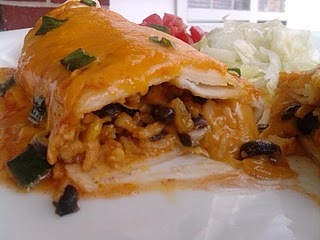 Once they are finished, toss in about 2 cups of cooked rice, mix and fill enchiladas as you would with chicken. For the Slow Cooker: Put the chicken in a slow cooker with the taco seasoning, garlic powder, onion powder, chili powder, chopped onion and add just a little water in the morning on low. The chicken is easily shredded by late afternoon. Shred the chicken, place back in the crock pot and add half the green onions and the lime juice. Cover and simmer 15-20 minutes. Prepare soup and sour cream mixture on stove, and add to crock and stir well, cover and simmer another 20 minutes. Then just assemble the enchiladas and bake. *** I'll be looking for a new linky tool for next week since I want the thumbnails to actually be visible in my post. BOOOOO! Man! Now I'm hungry for them again! Thanks for the love =) I'm glad you liked them.